Are you interested in floral design, home or event decoration? Do you like creating flower decoration in your free time? Would you like to know which type of flowers can be tided in a bunch? where participants will be able to learn and practice veracious flower bouquet preparing / florist techniques, trends and style. We welcome both amateurs and professionals in our groups. 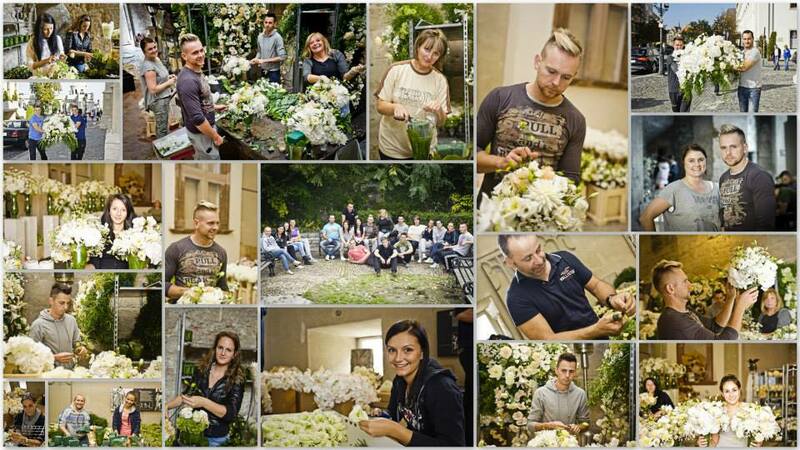 In our smaller sized workshops our professionals will help you to learn florist techniques in an agreeable ambiance. The dates of our planned workshops can be found here and on our Facebook site. The participation fee of our smaller sized (max. 10 person) workshops is 25.400 HUF/person/occasion, which includes the participation fee and the prepared composition. On this workshop our professionals will present you the ways to prepare unique table decoration. Most families are concerned by this intimate feast when Mothers are greeted with a nice bouquet of flower. Bouquet or flower box preparation will be presented by our professionals. A pleasant summer evening party can be made unique by a special flower decoration. Using seasonal flowers we create loosely set table decorations. The feast of Halloween has become more popular in Hungary too. During this session we show you some tricks to prepare pumpkin ornaments, pumpkin lamps and other special decorations. Preparing for Advent and Christmas we introduce to arrange beautiful decorations and door ornaments using seasonal flowers, green plants and colourful candles. For registration to our workshops please fill out our form. In the message field please indicate the theme and date of the selected workshop. Please feel free to call us in case of any questions. : + 36/30 408 3474.